Theatre rarely engages all of our senses. Even the words that refer to us as theatregoers – audience, spectators – emphasise sound and sight alone. But The Body, as its title suggests, is interested in every last muscle and fibre of the live experience. 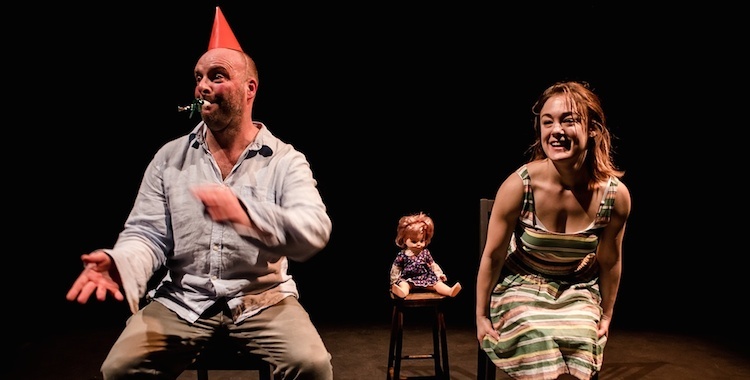 Nigel Barrett and Louise Mari’s show, the recipient of this year’s Oxford Samuel Beckett Theatre Trust award, is theatre that asks us to feel – in every sense of the word. Narrative, therefore, is abandoned for sensation. Instead of scenes, Barrett and Mari have created a series of fleeting impressions, each as strange and vivid as the last: lights brightly flare; sounds assault us from all angles; images flash on a screen while vibrations shake us in our seats. The one connecting thread is the constant “thump-thump” of the human heart. We enter designer Myriddin Wannell’s intimate black cube and are instructed to attach heart rate monitors. Performers Barrett and Jess Latowicki whirl in and out through revolving doors, handing each of us a doll that has its own uncanny heartbeat. This feeling of the uncanny pervades the show, which is littered with dolls – plastic, mechanical and sometimes unnervingly lifelike. Manoeuvred by Barrett and Latowicki, these disturbing synthetic figures are a counterpoint to the messy biology the show explores. They also pose the question of what really makes us human in an age of advancing artificial intelligence. Arguably more installation than theatre, The Body is bold in its rejection of story and embrace of technology. Those hoping for plot or character will be disappointed, but as a set of images and sensations it’s often breathtakingly beautiful. The show’s ambition of sensory overload is to interrogate something of what it means to be human and all too briefly alive. Like life itself, The Body is confusing, fragmented and sometimes overwhelming. But, also like life, it’s a strange yet extraordinary experience.